Get a repair manual for only $20! Use This Link -It helps support this site! You think you know how to do it, buy have never tried yourself and are tired of paying someone else $40 to change it for you. Well worry no longer because Mike takes the mystery out of changing your oil with these comprehensive instructions! *remember to check your oil level every 500 to 1000 miles as the GS500 is notorious for burning oil! 21mm socket. I didn't have one handy, so I used the wrench for the wheel nuts of my car. Worked great. A 3/8" spark plug socket will work as well. Luc says that his 2000 California model had a 17mm plug, so check before buying the tool. 10 mm socket with extension. 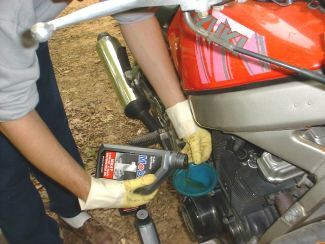 3 quarts of 4-stroke motorcycle oil. I bought 4 to be safe, but 3 are enough. Newspapers or carboard to catch spills. Oil filter (optional.). You can get from auto parts stores. Fram part number is CH6000. 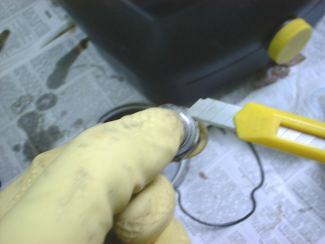 O-ring for oil filter cover (optional.) Come already with some aftermarket filters. 30-40 min of your time. Put the bike on the centerstand on a plain area. 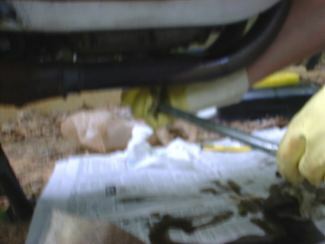 Spread newpapers under the engine to catch oil spills, and position the oil pan under the the oil drain plug. 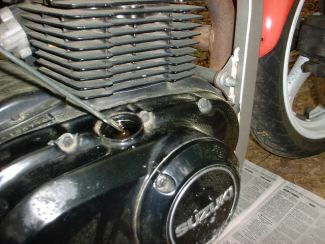 While the bike is still cold, loosen the bolts on the oil filter cover with the 10 mm socket just enough that you don't have to struggle later when the bike is hot. You really don't want to put your hands there and fight the bolts when the pipes are hot. Make sure that the oil does not leak out at this point though. Wear gloves and safety goggles. 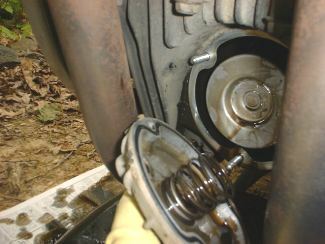 As above, loosen just a bit the oil drain plug located under the engine with the 21mm socket. 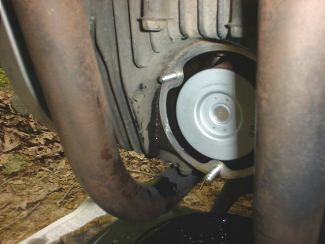 Again, make sure there are no oil leaks. This picture was taken at the end, so you see oil everywhere. Sorry for the bad quality, both hands were busy. Now start the engine and warm it up for about 5 min so that the oil will flow out easily. Stop the engine and let the pipes cool down for a few minutes. Unscrew the dip stick on the left of the engine and leave it off. Check the o-ring on the cap. Replace if broken or brittle. 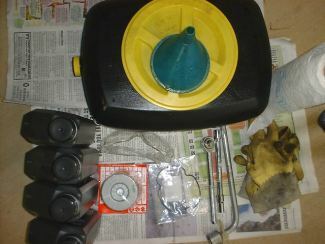 Remove the oil filter cover and expose the filter. 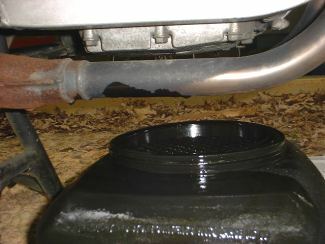 Remove the filter and let it drain on the oil pan for a while. 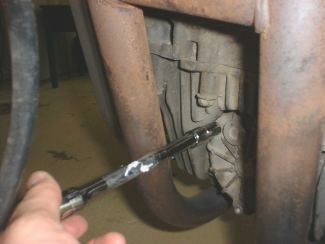 Suzuki suggest to replace the o-ring at every oil change. I think you can keep the old one as long as it is in good shape and there are no leaks. If you decide to replace it, remove the old one with a knife, smear some fresh oil on the new one with a finger, and fit it in place. 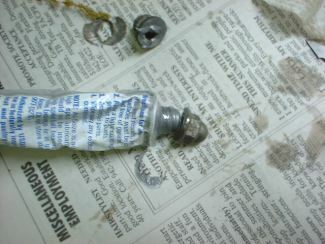 You should also replace the crusher washer on the drain plug. I dind't have one, so I left in the old one. Besides it's really hard to take it off. Fit the new filter. The hole goes towards the engine. 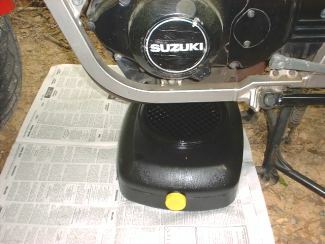 Suzuki suggests replacing the filter at every oil change. Everyone has his/her own opinion on whether and when it's best to replace it. My opinion is that if the old filter is not too dirty, you can keep it. If you want to have peace of mind, replace it. 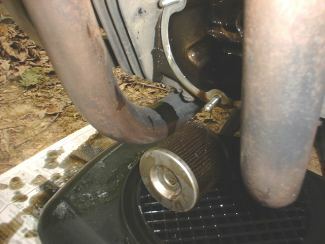 (Optional) Use anti-size compund on the thread of the nuts of the oil filter cover so that you can remove them easily next time. Close all the bolts and the drain plug. DO NOT OVERTIGHTEN since the bolts are prone to breaking, and close each nut a little at a time until tight. Suzuki suggests 10W40. The weight you need to use depends on your driving condition. If you drive a lot in slow traffic or see the redline regularly, you may want to use a heavier oil. If instead penguins are your riding mates, you might want to use a lighter oil. I used Mobil1 10W40, fully synthetic, mainly because I am very satisfied with Mobil1 on my car. Pour about 2.5 quarts of oil in the cranckcase. Make sure the funnel is clean before doing that. You don't want any dirt travelling around in your engine. Check the oil with the dip stick. Add more if necessary. 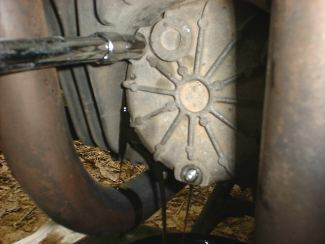 The oil is read without screwing the stick in, just drop it on the casing and let it rest there. The owner's manual says it holds 3 quarts. I used about 2.8. Screw the dipstick in and run the engine for 2-3 min at idle. Drwebb suggests turning off the safety switch and clicking the starter 2-3 short bursts until the oil pressure light goes out to prime the oil filter first. Check the oil level again and add more if necessary. When done, make sure all bolts and screws are well tight, clean up everything and bring the old oil and oil filter to a recycling center. Please do not throw the oil into a drain or into the soil as it is very polluting. Also, do not put the rubber gloves back in your kitchen: motor oil does not mix well with food. Feel good about yourself, but drink that beer you have in the fridge only after you GO FOR A RIDE. 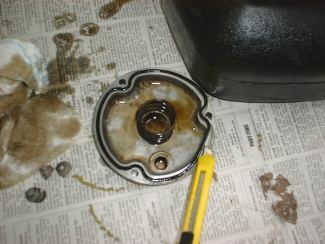 After a few miles, check the oil level again and top off if necessary. Now you can drink that beer. About GStwin.com. Send mail to gs500page@hotmail.com with questions or comments about this web site.